1. Adjust oven rack to lower-middle position, and preheat oven to 325 degrees. Whisk flour, salt, and baking powder in a small bowl; set aside. Coat an 8-inch-square baking pan with cooking spray, and, fit an 8-by-16-inch sheet of aluminum foil in bottom of pan. (Foil overhangs both sides of the pan; use as handles to remove baked brownies from pan.) Coat foil with cooking spray. 2. In a medium heat-proof bowl set over a pan of almost simmering water, melt chocolate and butter, stirring occasionally until mixture is smooth. (Alternatively, melt chocolate and butter in microwave oven.) Remove melted chocolate mixture from heat; whisk in 1 cup sugar and 2 teaspoons vanilla; then whisk in 3 eggs, one at a time, fully incorporating each before adding the next. Continue whisking until mixture is completely smooth. Add dry ingredients; whisk until just incorporated. 3. In a small bowl, beat cream cheese with remaining ¼ cup sugar, ½ teaspoon vanilla, and egg yolk until of even consistency. 4. Pour half the brownie batter into prepared pan. Drop half the cream cheese mixture, by spoonfuls, over batter. 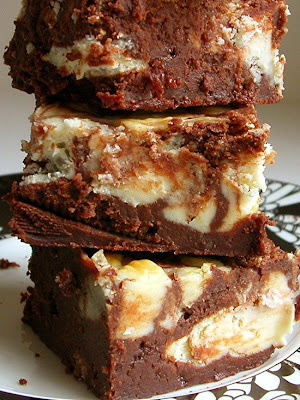 Repeat layering and swirling with remaining brownie batter and cream cheese filling. Use blade of a table knife or a spoon handle to gently swirl batter and cream cheese filling, creating a marbled effect. 5. Bake until edges of brownies have puffed slightly, center feels not quite firm when touched lightly, and a toothpick or cake tester inserted into center comes out with several moist, fudgy crumbs adhering to it, 50 to 60 minutes. Knowing when to remove a pan of brownies from the oven is the only difficult part about baking them. If you wait until an inserted toothpick comes out clean, the brownies are overcooked. But if a toothpick inserted in the middle of the pan comes out with fudgy crumbs, remove the pan immediately. If you are a nut lover, you can stir 1 cup toasted walnuts or pecans into the brownie batter. To melt the chocolate and butter in a microwave oven, microwave chocolate alone at 50 percent power for 2 minutes. Stir chocolate; add butter; and continue microwaving at 50 percent for another 2 minutes, stopping to stir the mixture after 1 minute. If chocolate is not entirely melted, microwave an additional 30 seconds at 50 percent power.